Why should you care about having the best PCI wireless card ? Well, imagine for a moment; You just purchased a brand new gaming PC, and are excited to test out the latest online multiplayer games. You switch on the PC, get your gaming gear (mouse, headphone, and keyboard) all set up, then leap into matchmaking to pwn some noobs. As soon as you enter the game, you notice something strange. Even though your PC is more than capable of running the game at a high framerate, your actual online experience is rather unpleasant. Frequent lag, desync, and stuttering can bring even the most skilled players down onto their knees. But wait- instead of smashing your keyboard in frustration, or sitting on hold for your internet provider, have you checked to see if your computer has a decent PCIe WI-FI card installed? After all, the quality of your internet connection doesn’t matter if the interface between your ISP and PC is garbage. The WIFI adapter in your PC is what allows you to connect with an access point next room; Even the highest quality gaming routers are useless if you pair them with a cheaply built WIFI card. What separates a cheap WIFI card from a good one? What do the alphabets mean? Will a better WIFI adapter make my internet faster? I have a whole bunch of WIFI devices in my home, which card should I buy? Will my computer be compatible with the latest WIFI standards? What are MU-MIMO and Beamforming? Can I use a USB WIFI adapter for gaming? So which one is the Best Wifi Card for Gaming? 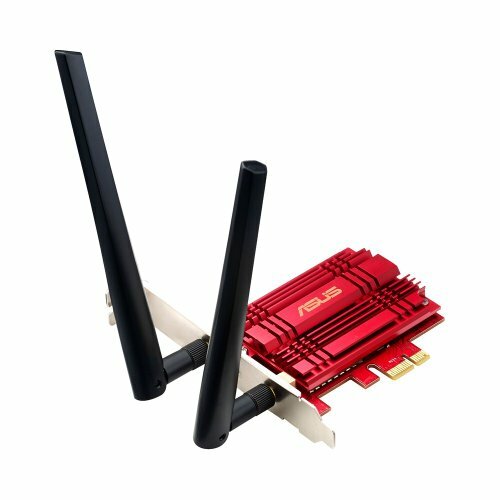 It has been here for almost 4 years now, and was introduced to the market as one of the first true high-speed 802.11 ac WIFI adapters for gaming PCs. ASUS slapped a beefy heatsink on the top and used high-quality components in the circuit for minimal signal distortion. It even comes with a low-profile bracket for ITX and mini-ITX cases. 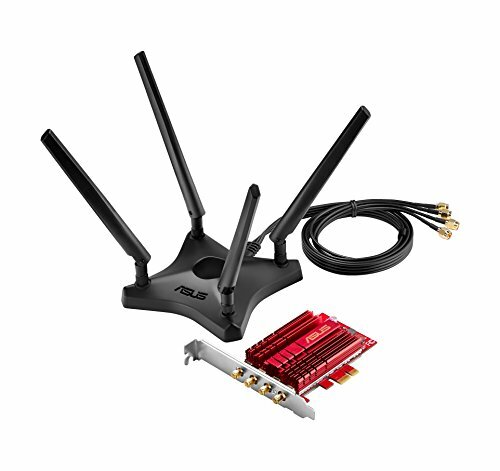 With 802.11 ac support, this ASUS Wi-Fi adapter can hit a maximum theoretical speed of up to 867 Mbps with single clients. And if you still have old laptops or phones in the house, worry not- this Wi-Fi adapter is backward compatible with n-standard devices so you can provide wireless internet access to all kinds of devices in your home. Smart TVs, computers, phones, servers, etc. will benefit from the dual-band capabilities of this ASUS PCIe wireless adapter. It can operate in both the 2.4 and 5GHz bands, meaning your wireless devices don’t have to compete with each other for bandwidth. The 5GHz band is capable of insanely fast speeds, but at the cost of decreased range. There are two high-gain antennas that come with the PCIe card, you can either screw them onto the provided bracket to maintain a neat and compact look on your desk, or you can hook up the external antenna stand that is provided within the box. This stand helps you bypass interference by mounting the antennas in an elevated position, such as the top of a cupboard or shelf. You can even attach this external antenna mount to the side of your desktop, since it features a soft-touch magnetic base that will stick to the metal sides of your PC case. Also included within the box, are driver CDs (which are guaranteed to be obsolete). The most reliable way of procuring the correct drivers for your brand new ASUS PCE-AC56 is to visit the official ASUS website from where you can download the latest drivers depending on the version of the OS you are using. Consistent speed across multiple devices. Will function well even with concrete walls and furniture blocking the path between your router and WIFI adapter. Prioritizes gaming data streams over regular downloads and updates, allowing you to enjoy a smoother online experience in multiplayer games. Comes with a low-profile bracket for mounting in SFF (Small Form Factor) systems. Beefy heatsink ensures that performance doesn’t deteriorate over time, due to heating problems. Color scheme blends in perfectly with any red/ black themed PC build. TP-Link is a well-known name in the networking industry, their routers and wireless technologies have revolutionized internet access in businesses and homes across the world. What makes TP-Link so great is their flexibility- they make cutting-edge products for a steep price, but also take care of the average customer with their cheap, yet extremely reliable offerings. The Archer T6E fits the archetype of a budget TP-Link product- it contains various innovative technologies and is built with quality components, yet manages to be the cheapest PCIe wireless card on our list. If you have around 50 bucks to spend on a wireless networking card for your gaming desktop, but are confused with all the technical jargon and marketing schemes of big brands, we recommend the TP-Link Archer T6E AC1300 PCIe card. This is a no-nonsense, performance-oriented piece of hardware that does exactly what it says on the box. Nothing less, nothing more- a solid 1300 Mbps 802.11ac wireless card that is designed to give your desktop the ability to connect with any WIFI access point in your home. And it is backward compatible with b/g/n standards, so you can hook up older routers and AP (Access Points) with this PCIe card. The design is not too outlandish or flashy- just a plain old silver/ gray heatsink on top of a well-built circuit board. There are a couple of antennas mounted to the bracket, and you can detach these antennas if you wish to mount them further away from the gaming PC to decrease signal interference between your PC, phone, printer, console, etc. Like all modern 802.11ac adapters, this one supports dual-band 2.4/ 5GHz WIFI. The 2.4GHz band on a single client can go up to 400Mbps, while the 5GHz band on a singular client can hit 867MBps. Add them up, and you get the promised ~1300 Mbps theoretical speed. The Archer T6E AC1300 PCIe card supports a wide range of signal modulation technologies such as DBPSK, DQPSK, CCK, OFDM, etc. to give you reliable upload and download speeds. Thanks to all these modulation technologies, your computer will not experience much change in internet speed or latency even when several devices are connected to the home WIFI at the same time. Perfect for online gaming, 4K video streaming, Skype, Discord, etc. The antennas are detachable, but you are not provided with an external mounting base such as the one you get with the ASUS PCE-AC56 wireless card. Color scheme suits a white-themed PC build, but stands out awkwardly in other systems. While it may not have the unique beamforming technologies of ASUS or TP-Link, this interesting little multitasker from Gigabyte features a built-in Bluetooth 4.2 module alongside the 802.11ac Dual-Band Wi-Fi. So you can use the GC-WB867D as an all-in-one solution for your gaming desktop, capable of transferring files between any phone and your desktop without having to use cloud share or micro USB cables. Although this is a Gigabyte branded product, the actual chipset itself is made by Intel, which is amazing since Intel is a well-known wireless chipset manufacturer and makes quality stuff. Gigabyte managed to cram some extra goodies in there, such as the Bluetooth 4.2 support. Note that it only comes with one antenna, unlike the other PCIe cards on our list which feature 2 or even 3 antennas depending on the strength and quality of the adapter. But this one antenna is plenty for daily use, and even competitive online gaming. It is a combo design, meaning that both the Bluetooth and WIFI signals are received through this single antenna. It cannot be mounted directly onto the PCIe adapter card, you get a cable to connect the antenna with the card. This antenna is fixed onto a plastic base, which has a magnetic coating on the bottom that comes in handy when you wish to stick the antenna on your PC case. One drawback of having a single antenna is the added WIFI “dead zones”. You will have to fiddle around with the position of the antenna and keep it in a clear line of sight from the router if you want maximum speed and lowest latency. However, if all you want to do is browse the internet and watch some 1080p YouTube videos, it will work perfectly fine even when the router is as far as 40 feet away, with walls and people blocking the signal path. We noticed that the WIFI speed is affected if you use both the WIFI and Bluetooth simultaneously. So, if you’re gaming and happen to also carry out a file transfer between your computer and Bluetooth printer, you will notice a temporary spike in latency while the printer is communicating with your PC on Bluetooth. And in order to use the Bluetooth feature, you need an empty USB header on your motherboard. You can still use the wireless card without the Bluetooth functionality, as only a WIFI card, if you don’t have a vacant USB header on your motherboard. No heatsink on top, which means that the card will heat up faster and lose performance over extended periods of gaming. Remember the TP-Link Archer T6E that we just reviewed earlier in the article? Well, the T9E is its big-brother and comes with a bunch of amazing extras. Features such as TP-Link’s explicit beamforming technology that allows for faster data speeds through obstacles between the router and the PCIe wireless card. And a larger aluminum alloy heatsink that keeps the chipset cool even after several hours of intense gaming and downloading. While the Archer T6E had a maximum theoretical single client speed of up to 1300 Mbps, the T9E boasts a maximum speed of 1900 Mbps. This theoretical speed is because of the adapters Dual-Band capabilities. It uses both the 5GHz and 2.4GHz spectrums for WIFI data transfer. The 5GHz spectrum has a maximum speed of 1300 Mbps, and the 2.4GHz spectrum has a maximum speed of 600 Mbps, resulting in a total throughput of around 1900 Mbps. Although to be honest, in real life you will never achieve those kinds of speeds. That is because there will be obstacles between your WIFI router and PCIe wireless card. And then you also have all the other electronic devices in your home which create electromagnetic interference, such as phones, microwaves, smart TVs, other computers and laptops, etc. TP-Link doesn’t guarantee 1900 Mbps, no WIFI adapter manufacturer ever tells you that their product can achieve the maximum rated theoretical speeds. But in real life, the T9E does get higher speeds than most other wireless PCIe adapter cards. Why? Because of certain clever technologies that boost signal reach and quality, even through obstacles and over longer ranges compared to most other PCIe wireless cards. For instance, TP-Link has incorporated Beamforming into this wireless card which boosts incoming directional WIFI signals that bounce off the surfaces in your room and are directed straight at the antennas of the PCIe card. It also comes with 3 antennas, which allows for superior transmission and reception over longer ranges. If you have a large home, or if there are a bunch of obstacles between the router and your gaming desktop, this is the PCIe WIFI card that we recommend. If money isn’t a concern, and you are willing to go all-out in exchange for the best wireless networking adapter, this is what you want. The ASUS PCE-AC88 which has a 4 x 4 antenna setup for transmitting/ receiving data over a true dual-band spectrum (5GHz and 2.4GHz). It is capable of insane speeds at very large ranges, and has no trouble with capturing signals even through the thickest of concrete walls. The PCE-AC88 wireless networking card from ASUS is a beast. It supports all the latest technologies, and comes with some exclusive ASUS innovations to maintain signal quality and strength over long distances. ASUS claims 60% faster WIFI speeds compared to 3 X 3 802.11ac adapters such as the TP-Link Archer T9E. And their claim might be true, since this card supports a maximum theoretical speed of 3100Mbps, compared to the 1900Mbps of the TP-Link Archer T9E. The 5GHz band supports up to 2100 Mbps, and the 2.4GHz band will handle as much as 1000 Mbps, resulting in a total speed of 3100 Mbps which is spread across an array of WIFI clients such as phones, TVs, laptops, desktops, etc. And amongst all these devices, your gaming desktop will get the highest priority when it comes to bandwidth, because the chipset within this adapter intelligently parses through signal streams, constantly checking and evaluating the importance of each one. If you are gaming, the data packets reserved for gaming will have a higher priority, while your OS update or video download takes a backseat temporarily. The 4 dipole antennas are specially designed to capture even the faintest of WIFI signals through thick walls, and can transmit with a signal strength of 18 to 21.5 dBm in 802.11ac mode. And another really cool feature of this card is its MU-MIMO support. What is MU-MIMO? Well, you can check out our FAQ section below to find out more about this technology, as well as beamforming. But for now, all you need to know is that it enhances data speeds across multiple clients which are simultaneously connected to a singular WIFI access point such as a wireless router. 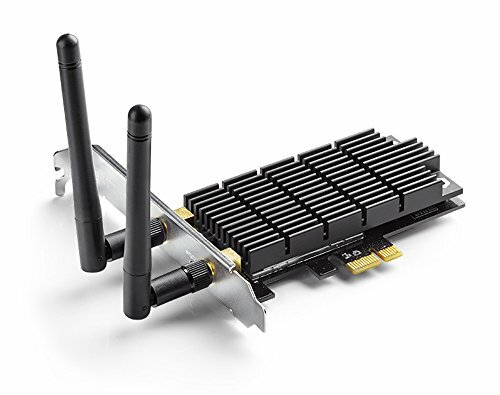 So if your phone, console, gaming PC, and TV are all connected to the WIFI router at the same time, a PCIe card with MU-MIMO technology will ensure minimal downtime and maximum utilization of bandwidth for your PC, freeing up the wireless internet highway for your other devices to communicate more efficiently with the router. And you can run up to 4 simultaneous WIFI streams, as long as your router supports it. All of this technology is great, but it also requires a lot of power to operate and can generate heat. Which is why ASUS has designed a custom red-colored heatsink to keep the chipset and all surrounding components cool even under the highest of loads. Cheap wireless PCIe adapters often feature poorly designed antennas, weaker chipsets, and don’t incorporate the latest technologies. Some of the cheap ones either have tiny heatsinks, or don’t even use a heatsink to extract all the heat from the chipset, because they know that their components use very little power and generate less heat. Expensive WIFI adapters, on the other hand, are equipped with the latest signal modulation systems, have high gain antennas to better capture WIFI signals over long distances, and feature 3 or more antennas for superior coverage across multiple devices. They also have beefy heatsinks to dissipate all the heat that is generated from their high power components. You may not know it, but a WIFI adapter has its own processor chip, memory, and mainboard just like your desktop PC. 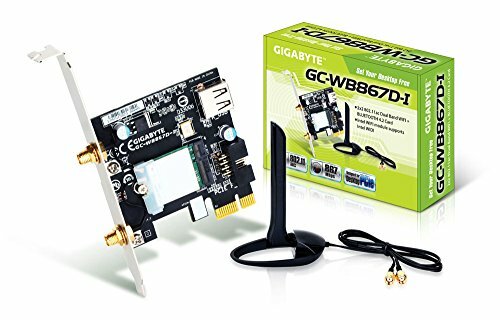 Spending more money on a WIFI adapter card gets you a product that will be future proof and capable of dishing out high-speed internet access to your computer. When we use the word “WIFI”, we are referring to the IEEE 802.11 standard of communication, and its various revisions/ updates. WI-FI (short for Wireless Fidelity) itself started out as a brand, a trademark of the alliance that promotes and certifies wireless technologies. It uses radio waves to transfer digital data between devices. So when you see the Wi-Fi logo on a device, it is usually accompanied with an alphabet, or a group of alphabets such as a, b, g, n, or ac. These alphabets represent the various revisions or updates to the original 802.11 standard for wireless communication that was introduced way back in 1997. The 1997 iteration of 802.11 supported a maximum data rate of 1.2 Mbps and has been obsolete for a long time. In 1999, 2 new protocols- a, and b were introduced. A could support up to 54 Mbps, while b protocol supported just 11 Mbps. Another difference was that 802.11a used the 5GHz radio band, while 802.11b used the 2.4GHz band. The n protocol, which can still be found in several phones and older laptops from before 2013, introduced even higher bandwidths compared to its predecessor g. It was more robust with wider support across a variety of networking gear. Wireless ac is the most sought-after standard today, and can support theoretical speeds up to 7 Gbps. 802.11ac devices utilize both the 2.4GHz and 5GHz bands, for a combination of speed and range. If you didn’t know already, higher frequency gives better data rates but at the cost of range since high-frequency signals get absorbed more easily by obstacles and lose their energy faster over distance. Low frequency (2.4GHz) has less data speed but higher coverage. So if you are purchasing a wireless device right now, make sure it features 802.11ac for maximum speed and versatility. No, that is not going to happen. Your internet is what it is- no device in your home will change the speed at which your ISP sends data to your home. If you want faster internet, it is time to consult your service provider. A wired connection is the best way to get the most reliable speed from the internet line coming to your house, but if you are using wireless routers the speed can vary based on the quality of the router and the type of PCIe adapter that you use in your PC. A higher quality WIFI adapter will decrease the signal loss from obstacles, and cover a longer range before signal strength weakens. A WIFI adapter that is more expensive can handle more devices simultaneously while maintaining a better speed on average across all devices. If you have 6 or more wireless devices connected to the WIFI access point at the same time, we suggest that you purchase the ASUS PCE-AC88 3100Mbps wireless card that we reviewed in our article. Its MU-MIMO technology benefits devices of all kinds by reducing network congestion. And its 4 x 4 dipole antennas improve signal reception even in crowded rooms to give you the maximum realistic speed possible from your internet connection. Yes, as long as the motherboard in your gaming PC has an empty PCIe x1 expansion slot, you can slide in any of the wireless adapter cards that we reviewed. The Gigabyte one also requires an empty USB header on the motherboard to take advantage of Bluetooth, but you can still operate it in WIFI-only mode if you don’t have a free USB header on your motherboard. MU-MIMO stands for Multi-User, Multiple Input, Multiple Output technology. It is a next-gen wireless ac or Wave-2 ac. 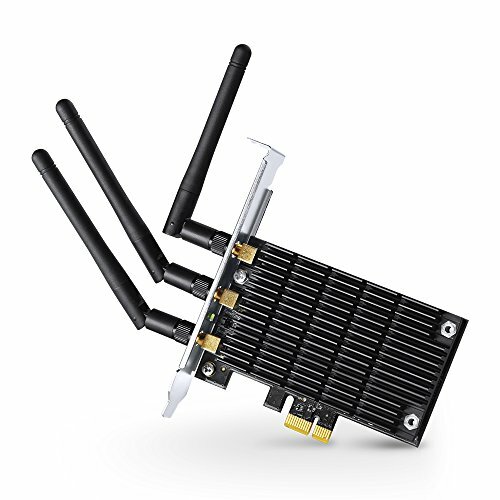 When 802.11ac protocol was initially released into the market, early 802.11ac routers and PCIe adapter cards could only communicate with one device at a time. Now you may be thinking, wait a minute- I have like 10 devices connected to the WIFI router in my home, how come you are telling me that my router can only transfer data to one at a time? Well, you see, the router does it sequentially and not in parallel. Your phone, printer, TV, laptop, and game console all talk to the router in a queue of priority. It sends out packets of data to one while the other is waiting. All of this happens so fast that it seems several devices are using the network together. But in this standard approach, your router’s bandwidth is being wasted. Your phone cannot leverage the whole data rate because it has one antenna, your laptop probably has two antennas, and your router may have 3 or even 4 antennas. It transmits data streams from all 4 antennas simultaneously, so at any given point in time, 2 or even 3 out of those 4 data streams are being wasted. Not with MU-MIMO technology. With MU-MIMO your router can simultaneously stream data to 4 or more devices. So your phone, laptop, and TV combined can access all of the bandwidth from all 4 antennas of the router. No device has to wait in line for the next one. This improves speed in the network and increases efficiency. Learn more about MU-MIMO here in this video. Beamforming is a technology that extends your Wi-Fi range, reduces interference from surrounding obstacles and devices, while maintaining a more stable connection between the router and your PCIe wireless card. A router without beamforming will send data in a spherical pattern, with radio waves traveling outwards in an expanding pattern, losing signal strength as they travel further. With beamforming, the router scans its surroundings and bounces the waves around intelligently to deliver the wireless signal directly to the device in a straight line. So less signal strength is lost over distance, and you get a more stable connection with higher speeds. You can learn more about Beamforming in this article. Implicit beamforming is when your router supports beamforming, but your desktop or laptop has a wireless adapter that doesn’t support this technology. You will still get some benefits in terms of speed, but the advantage will be minuscule. Explicit beamforming is when BOTH your router AND your wireless adapter support beamforming, resulting in a firm handshake between both devices for a much more noticeable boost in internet speeds. Which is why we highly recommend PCIe wireless cards such as the TP-Link Archer T9E and ASUS PCE-AC88. Both of these wireless cards support beamforming, and if you already own a router that supports beamforming, you will notice a massive boost in connection quality and speed while gaming. No, we don’t recommend it. USB wireless dongles or adapters are designed with convenience first, performance second. They are equipped with tiny antennas and weak chipsets, so they fail to deliver borderline acceptable internet speeds after you move like 10 or 15 feet away from your WIFI access point. They are terrible when it comes to latency, and you don’t get the same potential for speed since a USB connection doesn’t support high data transfer rates like a PCI express bus does. No PCIe wireless adapter on our list even comes close to competing with the ASUS PCE-AC88 3100Mbps adapter card. The beefy custom-designed red heatsink and thick mainboard performs better, looks great, and is built like a tank. The 4 x 4 antenna setup grabs all the bandwidth that your WIFI router can dish out, and transfers that speed straight to your computer through the PCIe bus. But before it does that, the MU-MIMO and beamforming technology kick in to ensure that the incoming signals are of the highest quality, resulting in a connection that isn’t just fast, but also more stable compared to any other PCIe WIFI card that we have ever tested. Latency is low, download and upload speeds are high. If your home is equipped with a high-speed fiber connection, there is no better way to leverage all that speed than to equip your gaming PC with one of these. Lastly, the ASUS PCE-AC88 can also support older devices that use the 802.11g or 802.11n standards, and it has dual-band capability so you can adjust for more range or higher speeds depending on how large your house is, and how many obstacles there are between you and the router.